Moving, and the associated downtime can be costly for your business. That’s why you need experienced commercial movers with in-house training and comprehensive resources in place to make your businesses relocation as efficient as possible. With more than 100 years in business and a partnership with the world’s largest and most respected van line, you can trust Hilldrup to make your business move worry-free. Our commercial movers have undergone extensive training and treat your assets with the respect that you’d expect from your own employees. Our commercial moving and office relocation services extend far beyond transportation. We provide a fully integrated approach for all of your moving needs. There’s no need for you to coordinate multiple vendors—we provide a flexible range of packing, set-up and behind the scenes logistics management. We can help you build a commercial move package to maximize your budget and minimize downtime without compromising on service. We begin each process by connecting you with a commercial move expert who serves as a knowledgeable point of contact from start to finish. Your Hilldrup moving expert works with you to design a move around your unique needs. This might include after hours services, IT disconnect/reconnect, warehousing, asset management and more. We also provide budget and cost analysis assistance to ensure you get the best return on your investment. If you’re looking to save time and money for your upcoming office relocation, contact us, or reach out to one of our locations near you to learn more about our how we can help you. 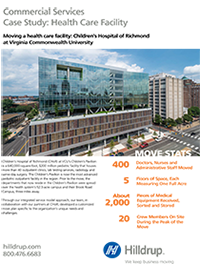 Learn how we helped Children’s Hospital of Richmond move multiple facilities into VCU’s Children’s Pavilion, their new 640,000-square-foot outpatient facility. 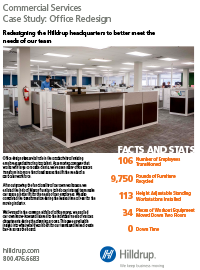 Learn how we worked with Maxon Furniture to make our space a better fit for our employees.